WordPress is a Content Management System (CMS) software. It used my almost 30% of the world websites. It is a platform where powerful websites are built and maintained. It has multiple themes based on different industry sectors. It also has important plug-ins that design the website professionally with business standards. What are the objectives of our WordPress Online Course? Our WordPress Online Training Course curriculum has been professionally designed by our Digital Marketing trainers. Our assigned trainer will cover all the important concepts and subjects of WordPress Website and Blog Website in depth with a detailed overview of themes and plug-ins. The CMS Online Training by Digital BigClasses will develop student’s web designing skills and will make them easily create interactive web designs. The CMS Training consists of various concepts of Domain and Hosting, Creating Account, WordPress Dashboard, Installing Themes, Creating Menu and Sub Menu, Creating Pages, Maintaining Web pages with Plugins, Installing Yoast SEO Plug-ins, Creating SEO Strategies with Keywords, and more. You will also be taught on designing a creative and engaging website with different themes and plug-ins. This CMS is easy to learn due to due Drag and Drop features. The websites can easily be created and maintained. It can be learned by anyone with no knowledge of coding. WordPress will be taught only in 20 hours, respectively. What are the skills that you will be learning with our WordPress training? Who should go for this WordPress Training Course? How will Advanced WordPress Training help your career? The WordPress CMS is used by many top companies, organizations, and brands in the world. There are no requirements for coding. It is easy and simple to use to due to the availability of plug-ins in its data. There are paid and unpaid plug-ins that will help the website look professional. There are different plug-ins such as Wpforms for customer interaction, MonsterInsights for Google Analytics, Constant Contact for email marketing, and many more. This CMS has also various paid and unpaid themes. The famous themes are Divi, Avada, Enfold, Optimize Press and more. A person can create a website by uploading any themes and installing plug-ins. They can create the entire website and also, upgrade it with SEO features. Therefore, the website can easily be ranked in the search engines with right website design, SEO strategy, and SEO friendly content. According to a research, there are total 29, 000 WordPress plug-ins. In the USA, around 22% domains are running on WordPress. Top Brands using CMS are MTV News, Sony Music, BBC America, The NewYorker, TechCrunch, and more. The most popular and downloaded WordPress Plug-in is the Akismet Plug-in. The second most popular and downloaded plug-in is the Yoast SEO Plugin. Digital BigClasses will provide a certificate to the students who successfully completed their WordPress training. The certification will be provided within one week of the training completion. The WordPress Training is being provided by Mr. Suresh with 9 years of experience in the Digital Marketing field. The curriculum prepared is up to date, and is constantly revised with the industry standards year over year. 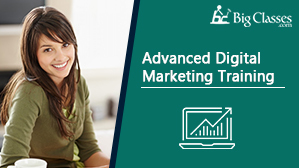 The online training will teach you the important concepts and subjects of Digital Marketing based on real-time case studies. Projects and assignment will be given for in-depth understanding of a subject. Course materials and E-Books will be provided and is accessible for 365 days only. Workshops will be conducted for quick learning for Entrepreneurs, Business Men/Women, and Company Employees. I own a small furniture business. I am a very busy man. I took some coding classes, but it was difficult for me. I heard about Digital BigClasses from my friend, and I joined the online training. I learned how to build a website with the training. I now have my own website. I am a student, and I wanted to learn about the easiest way to build a website. With the help of this training, I built a website, and I have my own website. I have added teachers and students, and we share our daily tasks and homework. We even ask doubt to our teachers. If anyone is looking for building a website from scratch without coding, I think they should learn WordPress. It is great, and it has all these amazing themes, and plug-ins. The training was very good. I have learned a lot. The WordPress training was good. I loved it. The trainer explained about the WordPress, and how many companies are using it. I liked the drag and drop thing. It is easy to make any website.